I’ve posted previously about Sea Scouting in Kansas (see links below), primarily focusing on the S.S.S. Kansan from Topeka, Kansas. Recently, a local collector sent me an image of a Sea Explorers shirt he picked up with a Kansas connection. The shirt, shown below, has a red and white “Independence” community strip and a “Kans.” state strip [these are a little difficult to see in the picture] on one shoulder, but the more exciting piece is the S.S.S. 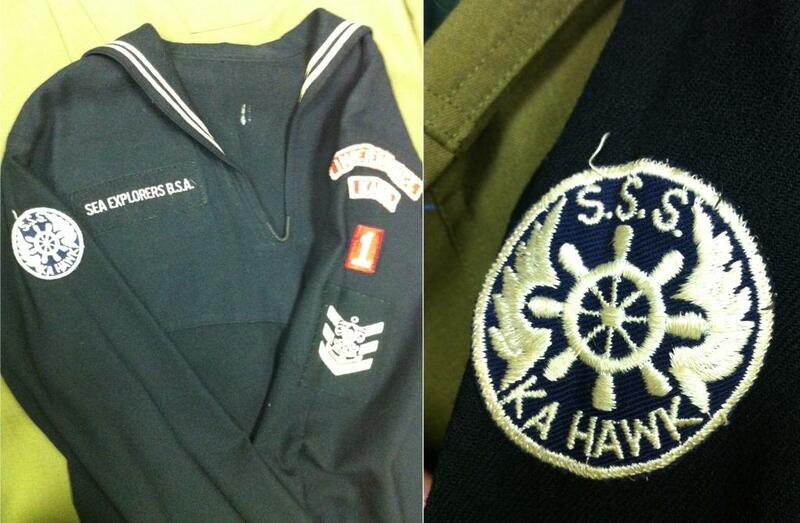 Ka Hawk ship patch on the other shoulder. I promptly did a search on “Ka Hawk” and found the S.S.S. Kansan wasn’t the only ship from Kansas to have success in flagship competitions. Apparently, the S.S.S. Ka Hawk was a part of the National Flagship Fleet in 1945 and 1946. 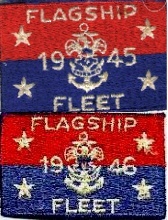 As a result, the crew would have received patches similar to those shown below. 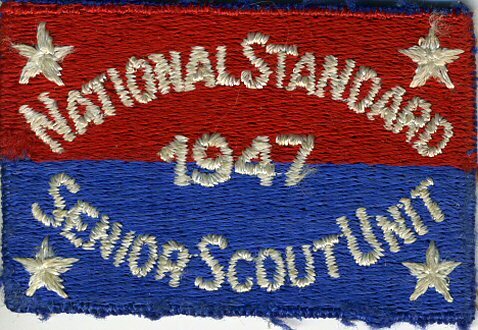 Additionally, the ship earned the National Standard award in 1947 for which the crew would have received the “National Standard Senior Scout Unit” award also shown below. Keep your eyes peeled for these Sea Scouting items with a Kansas connection. Note: A special thank you to Bruce Johnson for permission to use the images above. For more information about the flagship competitions see the history section at www.seascout.org. Thanks to Jody T. for sharing the Sea Scout shirt images.